I never really paid much attention to mirrored furniture until a beautiful mirrored chest was brought to my house during the recent living room and dining room install. It was a floor model that was brought as an option for a vestibule near the master bedroom. It wasn’t in the best of shape, but the idea was to see how it looked and order a new one if it worked well. Surprisingly, I liked it. It added a little bit of sparkle and interest to the space. I have always been a fan of a touch of glam, but just a touch. Generally mirrored chests seem to cross over into "more glam" category. 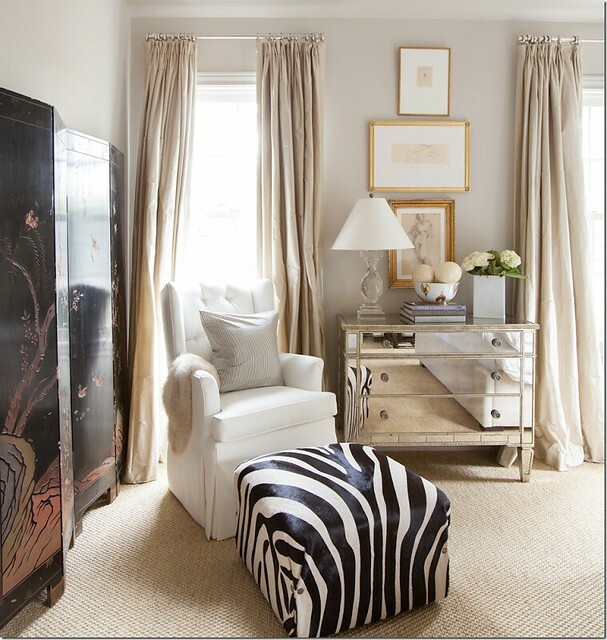 However, when looking through some inspiration pictures, I started noticing mirrored chests in the portfolios of some of my favorite designers and in some of my favorite rooms. 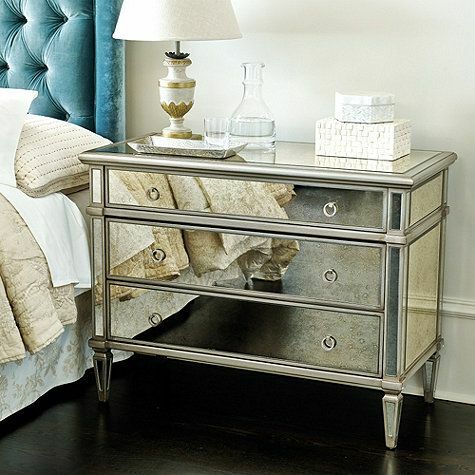 Mirrored chests seem to be a popular choice for bedside tables. 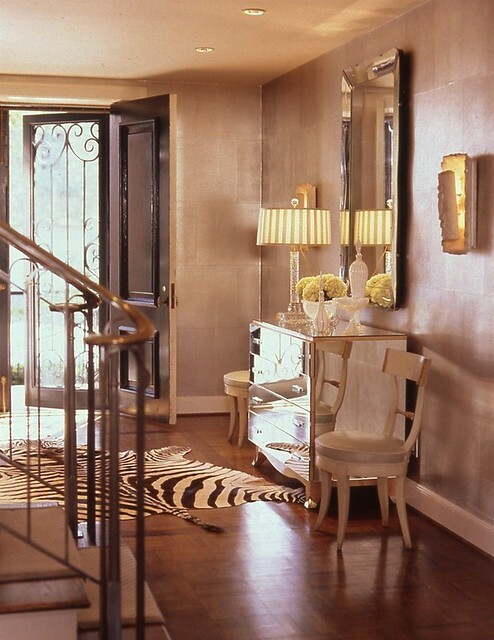 This image, via Veranda (design by Suzanne Kasler), shows the mirrored chest style that came to my house on install day. It is the Ceres Cabinet by Panache Design. Another Suzanne Kasler designed room, from an old real estate listing, shows her own Hickory Chair mirrored chest used as a bedside table. 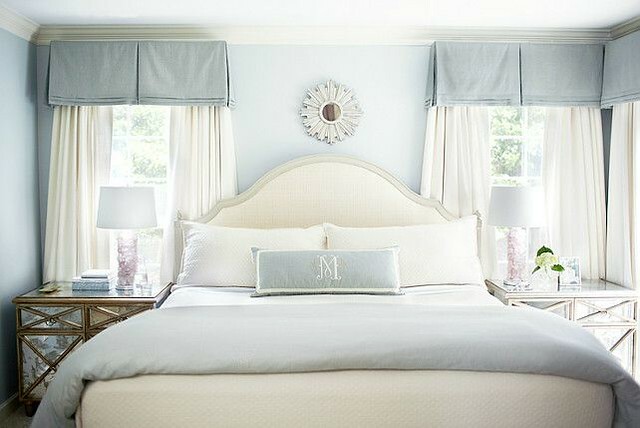 A guest bedroom in Suzanne’s own house also features her Hickory Chair mirrored chest in between twin beds. 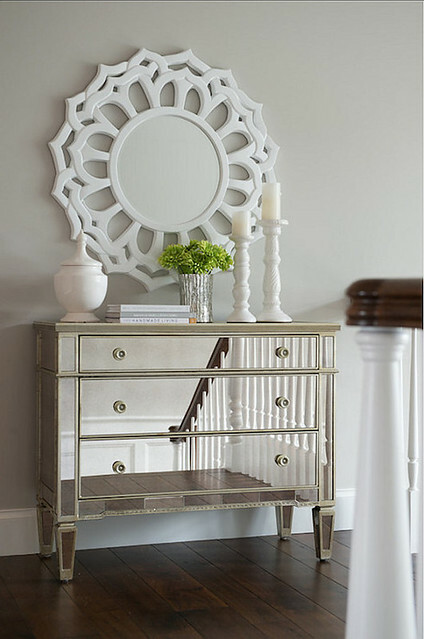 A lovely mirrored chest with a fretwork pattern on the front is a nice variation, and looks perfect in this room. Source unknown. 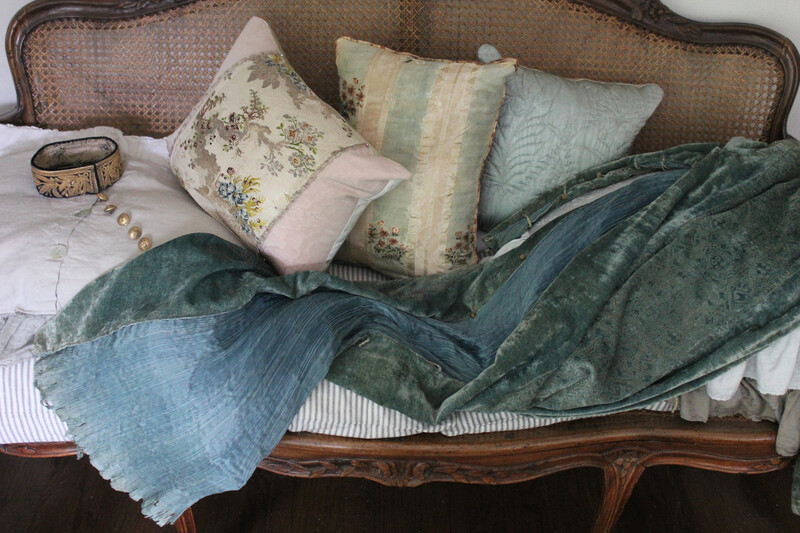 One of my favorite rooms by Ashley Goforth. 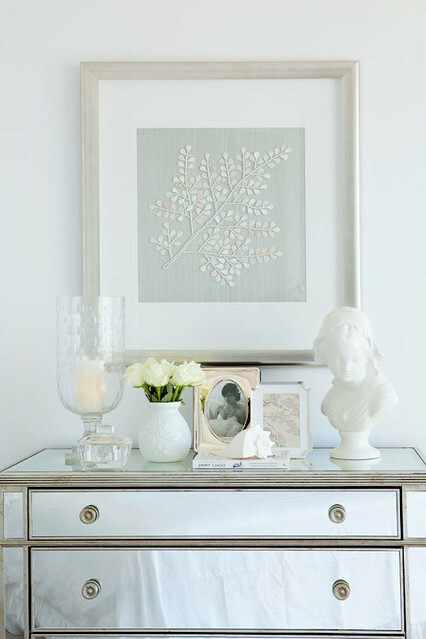 I have seen her use this mirrored chest in several of her room designs (it looks like one sold at Z Gallerie or Horchow, link at the end of this post). Note the use of a crystal lamp with the mirrored chest. 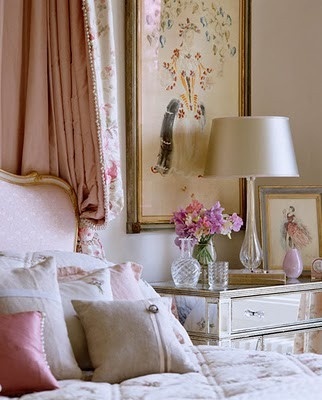 One of my favorite bedroom designs by Phoebe Howard. Howard also uses crystal lighting and accessories, which gives a light and airy feel in combination with the mirrored chest. Another Phoebe Howard designed room with a mirrored chest, the same style as the previous picture. I have not seen this chest in any of the online stores, but it is beautiful. 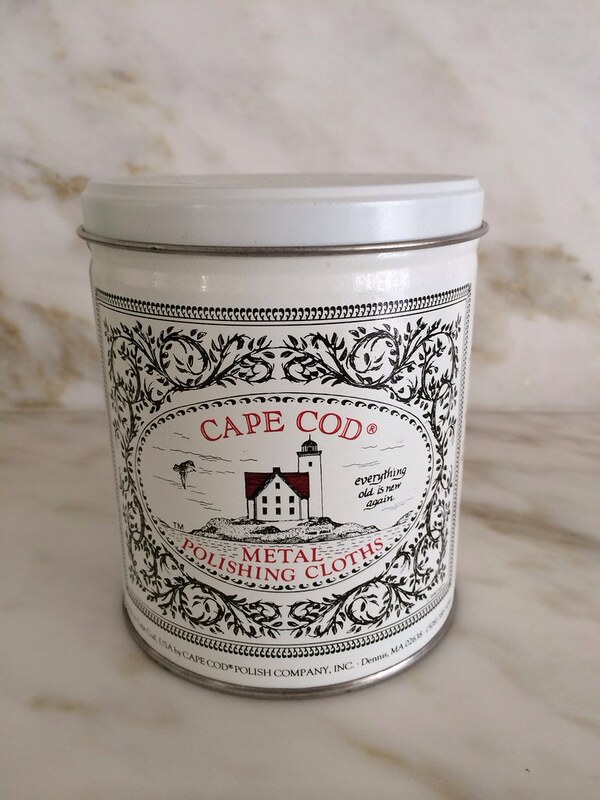 I love the criss-cross patern on the front; it adds an interesting detail. 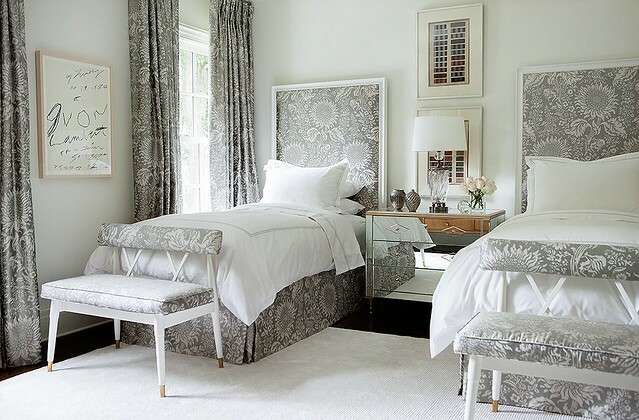 I love everything about this beautiful bedroom, and the mirrored nightstands look wonderful. I believe this are the Worlds Away Claude nightstands. Design by Cara Cox. A glamorous bedroom with lots of mirrors and crystal. Note the mirrored chests on either side of the bed. Found on Pinterest. Another pretty mirrored chest vignette in a bedroom, found on Pinterest. Although many of the inspiration pictures I found were in bedrooms, I also found plenty of mirrored chests in other rooms of the house. 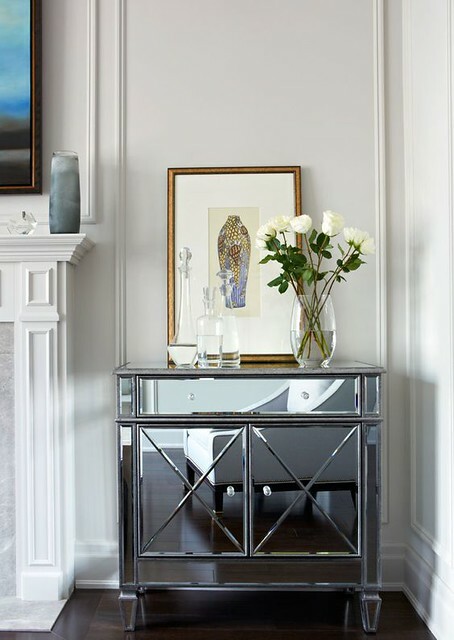 This mirrored chest, in a design by Studio M Interiors (in Minnesota), is used in an upstairs hall. A beautiful mirrored chest (I also think this is the Z Gallerie/Horchow chest) seen on Cote de Texas. This is one of a pair in the room. A real estate picture (seen on Cote de Texas) of an all time favorite room by Gerrie Bremermann shows a mirrored chest on the side of the room. This makes me like the room even more! This looks like a reversed antique mirror (more than likely the Lucy design by Worlds Away). 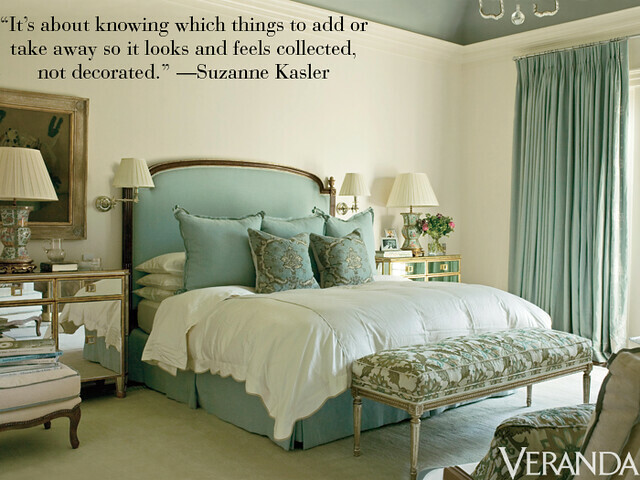 Design by Sara Tuttle Interiors. 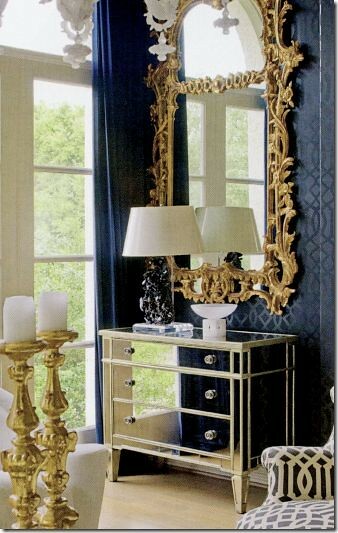 Beautiful vignette on a mirrored chest, found on Pinterest. I love the delicate art above the chest too. A small mirrored chest in a living room, found on Pinterest. One of my favorite designers, Jan Showers, is known for her glamorous rooms, so naturally she uses mirrored chests in many of her designs! This is a room I have featured numerous times on my blog, but I had never seen the other side of the room with the mirrored chest. 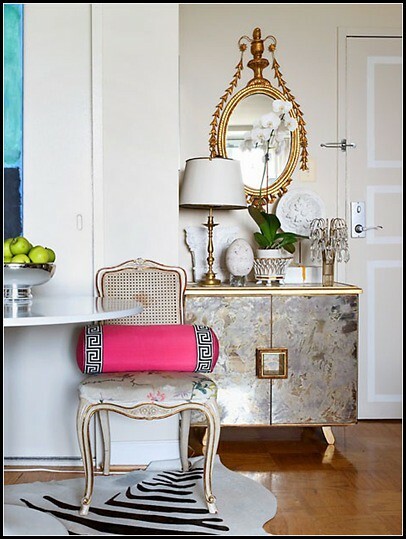 It is a beautiful introduction to the home, and the mirrored chest looks wonderful with the silvery gold tea paper on the walls. Another one of my all time favorite Jan Showers rooms, which uses a mirrored chest in the transition point of the room between the two seating areas. 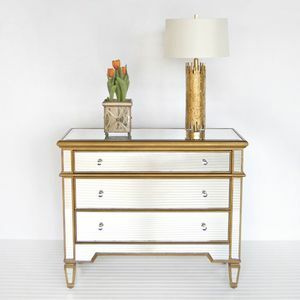 Ballard Designs - I believe this is the Deanna mirrored chest, although the pictures on the website appear more heavily antiqued than this one. 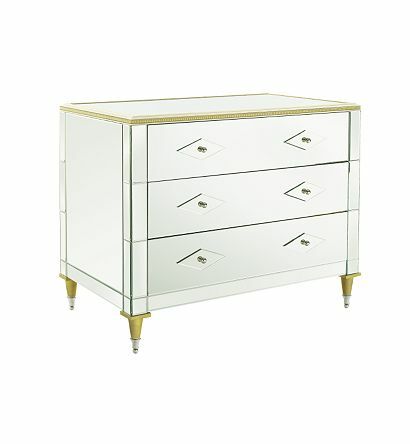 Borghese mirrored chest, available at Z Gallerie. This is the chest that seems to be pictured in many of the inspirational images in this post. I saw this one in person at Z Galerie and it is very nice looking. I would swap out the knobs as they are plastic looking, but the design of the chest is great. Horchow also has a version of this chest (perhaps identical) called the Amelia mirrored hall chest. So, what do you think of mirrored chests? 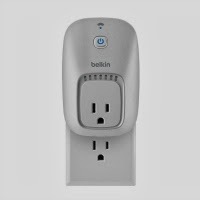 Can you see using one in your house? Unfortunately, I am going to have to hold off as I have blown through my design budget but I will certainly keep my eye open for interesting designs incorporating mirrored chests. I have the Z Gallery mirrored chest. I love it! Good to see it in so many high end houses. I appreciate the comments and "instruction" that you add to your photo research. I know it is more time consuming, but I love hearing what your thoughts are about other elements that appear in the photos as well. Do keep posting, you are a real jewel in this blogging world. I look forward to your ideas & thoughts about decorating. Thank you! I love them when they're aged. Wary when they're super shiny. some of them are quite beautiful -but often they just look cheap to me if the details aren't right (referring to the detail of the plastic looking knobs you mentioned). 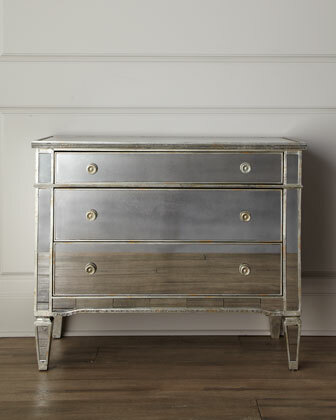 The Hickory Chair chest by Suzanne Kasler is really gorgeous. Thank you so much for this lovely post! I've been stumped working with my designer for months to try to find the right feel for my bedroom. 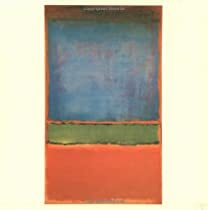 We went to NYC and the Paris Maison & Object show and flea market in January and I came back uncertain which direction I wanted to go with my room. 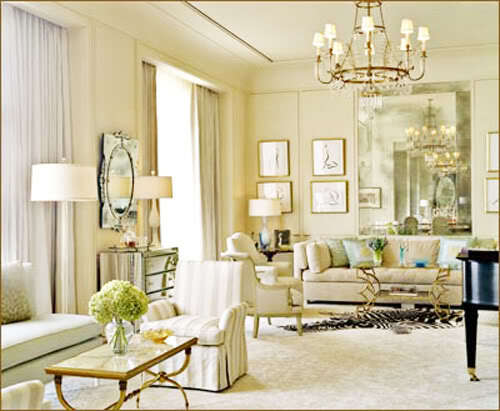 I particularly like the mirrored chest images with a mix of antiques in the room to keep it feeling softer. I appreciate these inspirational images! 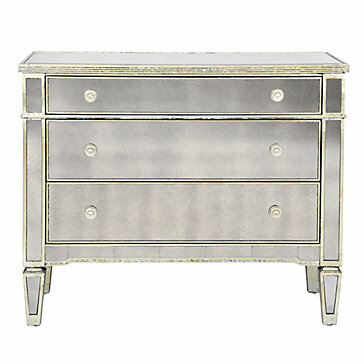 Like you, I like a touch of glam, and the mirrored chest is a perfect touch! Can't wait to see your room! Glad you are back! I enjoy your posts. Mirrored chests can be very pretty in the right setting but I wouldn't buy one for my own house. Blog on Holly. I was thinking about the photographers composing the images in the mirrors. Like you, I was never sure they were "me" because I'm not one for too much glam in a room. 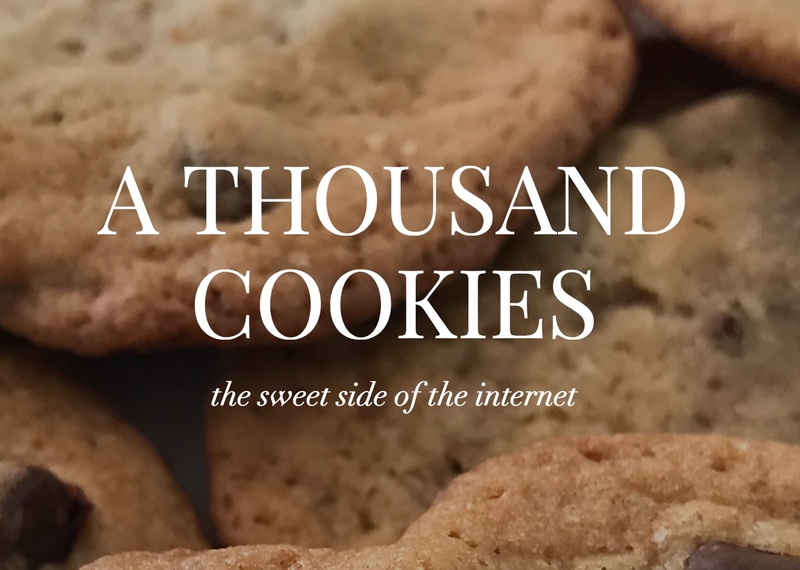 But I must admit, these photos are all gorgeous (many I had already pinned!) I didn't realize how many mirrored chests were in rooms I had admired. I especially love them in a bedroom. Can't wait to see where yours ends up!